Despite the unveiling of Honda's off the planet fuel cell wizardry at the opening of the L.A. Auto Show, Wednesday found the world’s automotive press excitedly reporting Honda’s Civic type R. Apparently race -ready out of the box, the Civic type R hits 124 mph from a rolling start in 10 seconds. 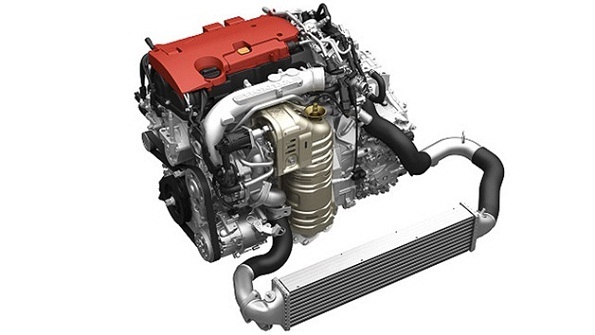 Torque News takes a look at the broad implications of the new power plant. As to the 2015 Civic R turbo, it’s damn fast, and reads like fun. But at an estimated msrp of $45,000 or so, Johnie down the street( most likely) won’t be driving one. None the less, with push button actuated performance mapping and suspension tuning, the R if released to North American markets sometime after 2015, is sure to please the SCCA weekend racing crowd. To date, driving reports are pocked with quips of fantastic acceleration, great G.P. type handling mixed with an annoying exhaust tone and pebble sensitive suspension and tire tension. Reads like a track car to me. When one steps back and takes a close look at the R, the heart starts pumping. Flat black and fat tracked, there’s no doubt that Honda engineering and race development has done its homework here. But as with most(all) major manufacturing race developed R&D, there is an ulterior motive to the publicized launching of a prototype. Most manufactures bench test future market up ticks on the racetrack and Honda is known for it’s raced developed innovations. In the case of the Civic type R we look to the European Union’s pending environmental mandates and compliance requirements for 2014. Europe has always taxed consumers based on the displacement of their car’s engine displacement. The bigger the displacement and the thirstier the beast is, the greater the penalty of ownership placed on the consumer by the government. In-fact many European nations will not allow the import of a vehicle exceeding a restricted engine displacement without first paying an excessive import or tariff tax penalty. Honda is not exception. As displayed by all major automotive manufactures including G.M., 2.0 is the magic number when it comes to environmental compliance. Saab and Volvo’s had one for years. Now Honda, the 18th largest automotive manufacturer on the planet steps up to the task at hand. Small, fuel efficient displacement motors producing high hp and torque output. The goal here is to develop a reliable small displacement power plant that will hold together while delivering V6 h.p.and torque curves. With the 2.0L VTEC Turbo, Honda's done just that. Want more power? Put a Turbo or a supercharger on it. While there’s a bit more to it than that, that's the push in automotive engineering as the world approaches 2020. It’s not a question of rather or not the 2.0 L VTEC Turbo will be made available to North American drivers, the question is when. My guess is next year, when model year 2015 is rolled off of the assembly line, you'll find a version of the 2.0 liter turbo available as an option on the Civic, Accord and CRV. Just an educated guess on my behalf. From a “green” perspective, its a logical step in Honda’s progression towards the future U.S. E.P.A. minimum of 50+ mpg; as mandated by the United States Congress. It will be interesting to see who gets there first on the road to affordable, fuel sipping sustainability. An exciting future for small displacement, fuel efficient high output turbos for Honda in North America. Sort of " back to the future" with higher quality components. One of the reasons I left Honda/Acura in favour of Subaru was the torque and HP that honda/Acura just didn't have in their 4cyl. I loved my RSX Type S which handled beautifully but compared to the power and grip of my WRX I know hands down that it was the right move. Hopefully Honda/Acura (more specifically Acura) get a hot 2 door coupe/hatch with turbo into the market soon!